Built with Carvico VITAfabric withcoldblack whichreduces heat build-up and reliable protection from the sun rays. Two back pockets have been re-designed for improved aerodynamics and featurereflective trim for security and visibility. Features a low density, lightweight chamois made for us exclusively by Berenis. Blue flatlock stitching and 20mm folded edge finish on arm openings. 6-inch inseam. 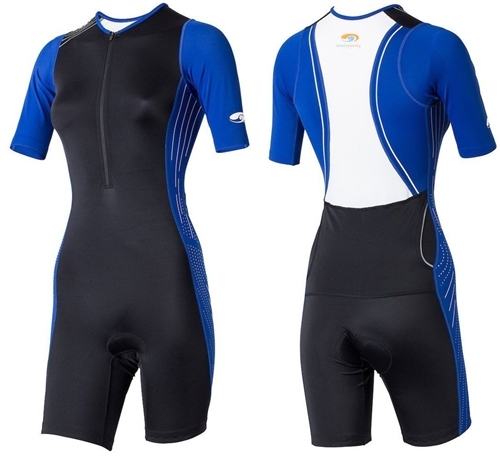 Our updated TX2000 tri suit is the tool you need to race your best. Combining cutting edge fabrics with an improved fit, this piece of kit is your ally on race day, elevating you to the next level in performance. This suit is exactly what I hoped for! Fits true to size, is stylish and is complimentary to any figure.